Can you say that all of your confidential waste is currently locked away? If you can’t, an office waste console could be the solution to your data protection needs. The security of your confidential waste whilst on your premises should be one of your highest priorities. Sensitive information about your company, customers, staff and suppliers can prove very costly if it falls into the wrong hands, not to mention a violation of GDPR regulations. What is a Confidential Waste Disposal Console? A confidential waste disposal console is a lockable container used for securely storing paper until it can be collected and professionally shredded. These consoles are sometimes known as confidential waste bins or lockable waste paper cabinets. 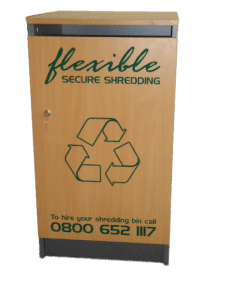 Shreddable paperwork can be placed into the console just like a normal waste paper bin but these consoles have been designed to be lockable to prevent any unauthorised tampering. Take the stress of manually shredding documents away from your team by renting our confidential waste consoles. We can supply any number of consoles to meet your company’s specific needs. Our consoles ensure that all of your unwanted confidential documents are stored securely, keeping your business GDPR compliant and your office organised. Your confidential waste bags are treated with the highest standards of security and data protection compliance when they are transported to our secure storage facility. All drivers and staff involved in the retrieval process are vetted and DBS checked. Your confidential waste will then be processed by industrial-grade shredders and pulverisers for guaranteed destruction. A certificate of destruction is provided for every batch. We can also provide an ad-hoc collection service for one-off collections of confidential waste sacks from your office. Ideal for smaller businesses or those with irregular levels of sensitive documents. Shredding your own confidential waste can be very time-consuming, often taking valuable members of staff away from more productive work. Proficient office shredders and on-site shredding companies also often come with hefty price tags. The only way to guarantee complete destruction of documents without breaking the bank is with our confidential waste disposal consoles. We offer them as part of our document shredding service to keep your confidential waste safe and your team free to focus on what really matters. If you’re concerned about the safety of your confidential waste and feel that a confidential waste console could take the burden away from your team, get in touch with our storage consultants today to discuss your requirements and receive a quote.